Pinos Genil, June 2017–Everybody agrees that the Alhambra in Granada is a worldwide wonder. And it’s ours. It lies in the same Sierra Nevada foothills as our village, Pinos Genil, which is just 15-minute drive away from the monument. Nevertheless, we seldom visit the Alhambra. We take it for granted. We can go some other day. So it was a nice incentive when Elisa, the culture delegate from our town hall, organized a tour for the people of our village a couple of Saturdays ago. Such is our complacency here in Pinos that we only managed to fill 28 places of a 55 seat bus. The other 27 missed out on a smashing excursion. It’s a shame because the “new” Alhambra is an authentic marvel that shines as never before (at least in the past 500 years). Apparently this has to do with the fact that all the money earned from the millions of people who visit the Alhambra each year is re-invested in the monument. And our guide was a polite, cultured and patient young man, a bonus. The Alhambra appears to have grown since I last saw it a couple of decades ago. Every visibile aspect of the monument has been lovingly renovated and areas once closed to visitors have been revamped and opened up. Everything shines, including the extensive gardens (El Generalife) which are impeccably kept. There are even some new excavations. Both the Palace of Charles V (Palacio Carlos Quinto) and the church of Santa María de La Alhambra (two massive buildings that were constructed by the Christians when they culminated the Reconquest and expelled the Moors in 1492) have been had their exteriors beautifully renovated. Note to travellers. Everything about the Alhambra is so large and so labyrinthine that you can get lost in there. (N.B. If you get lost inside the palace don’t try to trace your way back to the entrance. If you do manage to find it they won’t let you out. You have to turn around and go back through the maze till you find the proper exit. Which you won’t find unless you manage to encounter a compassionate employee to guide you out. Definitively, getting separated from the group converts a visit to the Alhambra into adventure tourism. I can’t resist posting this photograph Mike made the other day from the Gallinero’s little sun-moon and stars terrace. It’s been a wonderful springtime thus far with the mourning doves romancing high in the cypress trees and the bumble bees buzzing round the wysteria bush sucking nectar. The garden is surging and the summer terraces of the bars and restaurants are beginning to thrive. Everyone agrees. It’s a great time to be alive in Granada. We usually walk in the morning. It’s cooler and the air is clearer. The pictures Mike published here a couple of weeks ago were made on this same walk, but in the morning. In the evening it’s different, but equally delightful. The color of the evening light is warmer and the later it gets the rays of the sun slant through the trees and across the hills at a low angle. We were surprised that, though it’s only half an hour’s drive up the hill from our house, and we walked for less than an hour and a half, when we came back to the bar at the bottom we felt we’d had a holiday. Here are the pictures. (P.S. The last photo is of our house, my studio and the Gallinero from across the valley of the River Genil. The scene looked so serene as we were driving home that Mike stopped and shot the picture.). It’s late August so it’s hot. If you start out on a hike at nine by twelve or one you’ll wish you’d stayed home. But here in Granada the climate not only varies by latitude–the farther south you go the warmer it gets–but by altitude: the higher you go the cooler it gets. This is because Granada has Sierra Nevada, a mountain range that rises from some 700 meters of altitude–Granada’s marvelous tourist attraction, the Alhambra fortress and palace is actually built on one of the last spurs of Sierra Nevada–up to the 3,400 meters of Mulhacen, mainland Spain’s highest peak. So, the other morning Mike and I jumped in the car at 8:00 a.m. and drove 20 minutes up the Sierra Nevada road to a place called “El Desvío” (“The Detour,” as it’s where the old road divides from the new one) at 1,800 meters of altitude. In one of the bars congregated there we had breakfast–leche manchada con media tostada de aceite y tomate, milky coffee with half a toasted Vienna roll, virgin olive oil and grated tomato, and set off on foot along a gravel trail that leads to a remote convent five kilometers up the road. We didn’t make it to the convent but we enjoyed a delicious hour and a half hiking along the road. We took our dog, Cuca, with us. She also needs a workout. During the whole time we only saw one car and a handful of hikers, a real luxury. We enjoyed immensely the gently rising and falling trail, the stunning mountain views and watching Cuca hunting little skink lizards. She never catches one. Best of all was the temperature, never going beyond23 or 24º. Here is a selection of the pictures Mike made on the walk. The last photograph in this brief album shows some of Mila’s results. I like very much what she achieved. Come back and see us when you can, Mila. That was the plan. But when they arrived and saw Maureen’s studio and the work she was turning out there–after the usual How-did-you-do-that?! moment–they changed their plans and decided to get their fingers inky. Luckily they had both already seen the Alhambra on previous visits to Granada, because they spent the full four days they were here hard at work creating and printing solar plates. They left delighted with the results they had achieved, anxious to get back to California and enjoy some “How-did-you-do-that?! moments of their own. 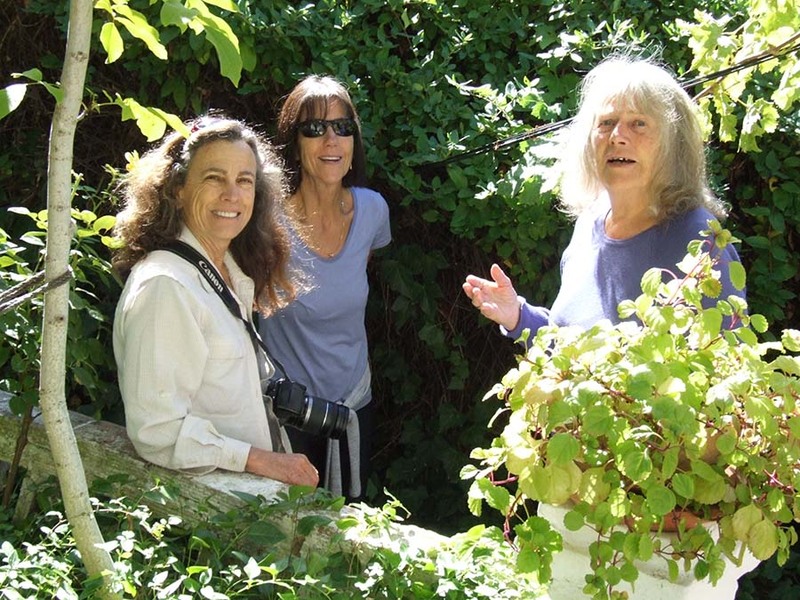 Susan Lyon and Maryanne Nucci–California girls from the Monterey area–spend four “stolen” days in the Gallinero and working with Maureen in her studio.